Williams is the gateway town to Grand Canyon National Park, the main entrance to which is 57 miles due north along Hwy 64 and US 180. The city center is fairly compact, extending along 2 miles of old Route 66, which parallels the ATSF railroad, half a mile from I-40. 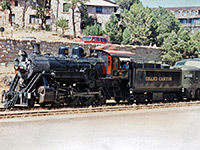 The Grand Canyon Railway begins here, winding northwards to its terminus right on the rim near El Tovar Hotel. Williams is surrounded by thickly wooded land of the Kaibab National Forest, which contains many small volcanic peaks and a much higher summit (Bill Williams Mountain) a little way south. Most shops, bars and restaurants are along Route 66, with a smaller group on Grand Canyon Blvd near the central I-40 exit. 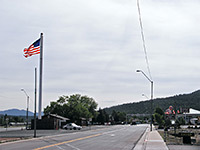 Williams also contains several RV sites, a sports park, the Arizona State Railroad Museum and one supermarket (Safeway). The newly constructed Holiday Inn Express Williams opened fall 2015, located in a lightly developed neighborhood on the west edge of town, opposite Grand Canyon Railway RV Park and within sight of wooded hills in most directions. All locations in the city center are within one mile; the railway station is less than half a mile away. The three story hotel has 90 rooms, a 400 sq ft meetings facility (enough for 20 people), and a dining area for the free hot breakfast buffet. Leisure amenities are an indoor pool, hot tub, bbq pit and 24 hour fitness center. Accommodations include a selection of suites with kitchenette and sofa bed. The Best Western is the first hotel in Williams for travelers arriving from the west - along old Route 66, just beside interstate 40 (exit 161, Bill Williams Avenue). The inn sits amongst ponderosa pine trees at the edge of the forested foothills of Bill Williams Mountain, which rises to 9,256 feet a few miles to the south. The hotel has 79 rooms, a heated outdoor pool, spa, gift shop selling Southwest souvenirs, and a dining area where good quality (free) hot breakfast is served. The center of Williams is one mile west, putting guests within easy walking distance of various restaurants and shops. Like most hotels in Williams, the Comfort Inn (formerly Grand Canyon Country Inn) sits along historic Route 66 - at the west end of town next to a supermarket, and a short walk from several restaurants. Rooms are fairly basic but modern, equipped with flat screen TV; some have a microwave and refrigerator, and those on the west side enjoy peaceful views across a field towards wooded hills. Free continental breakfast, free internet access, an indoor pool/hot tub, laundry and a business center are the other main facilities. The pet friendly Quality Inn of Williams has a pleasant woodland location along a short spur road on the north side of I-40 (exit 163). Old Route 66 and Williams town center are within walking distance, 0.7 miles south along N Grand Canyon Boulevard, though there are plenty of restaurants much closer, either side of the interstate. A heated outdoor pool/hot tub and free hot breakfast are the two main amenities of the inn, which has 79 comfortable rooms, all with coffee maker & ironing facilities. At 950 Grand Canyon Boulevard, the full service Ramada Williams is situated right at the north edge of town, adjacent to exit 163 of I-40, half a mile from the downtown area around old Route 66 (Railroad Avenue) and just a short walk away from undeveloped woodland. The clean and well maintained property offers 120 rooms (all containing microwave/refrigerator) on 2 floors, an indoor pool, guest laundry, convenience store/gift shop, and a restaurant/bar. The hotel is an easy 56 mile drive from the Grand Canyon, 33 miles west of Flagstaff, and half a mile from the terminus of the Grand Canyon Railway. One of few hotels in Williams not located on Route 66, the Howard Johnson Express adjoins a residential district along Grand Canyon Boulevard, about half way between I-40 and the town center. The interior corridor inn offers comfortable, low to mid level accommodation with the usual range of facilities, principally free continental breakfast, free wi-fi, a pool (indoor) and a business center. Sites within a short walk include a sports park, the Amtrak and Grand Canyon Railway stations, and a selection of restaurants. The location of Days Inn Williams is more peaceful and secluded than most hotels in town, being surrounded by pine woodland one mile west of the center, and occupying a slightly elevated site allowing north-facing rooms to have long distance views across the forest towards distant hills. There is one restaurant (Denny's) and a gas station adjacent. Other highlights are the free hot breakfast, the indoor pool/hot tub and the on-site convenience store. Guests here to work can take advantage of a business center and meeting space. The 41 exterior corridor rooms at Travelodge Williams are equipped with a refrigerator and coffee maker, and have views across the parking lot to the eastbound section of Route 66, near the east edge of town, one block from the edge of the forest. The nearest restaurant (Route 66 Diner) is directly opposite, and there are many more a short walk away. The motel has a small outdoor pool, right by the road but shielded by walls. Free continental breakfast is served each morning. Econo Lodge Inn Williams lies close to the most central of the town's three I-40 exits (163), near a sports park, two gas stations and at least six restaurants. Route 66 and the downtown district are half a mile south along Grand Canyon Boulevard. The inn provides some of the most affordable lodging in the area, though facilities are as expected very limited, just free wi-fi, free continental breakfast and a microwave/refrigerator in each room. Super 8 Williams enjoys a quiet and scenic situation along old Route 66 right at the east edge of town backing onto a wooded hill, set back from the highway and not close to any other buildings - the nearest restaurants & shops are a mile west. The 40 interior corridor rooms are clean and modern, service is efficient, and rates are low, yet facilities are still good, including an outdoor pool, free wi-fi and free continental breakfast. This is the first Williams hotel for travelers arriving along I-40 from the east. All guest rooms at Rodeway Inn Williams are on the ground floor, in two blocks either side of the parking lot, and they have views of wooded hills in most directions - the motel lies right at the west edge of town, beside Route 66 where it splits into separate, one-way lanes. A supermarket and various restaurants are within easy walking distance. Amenities are free coffee, free wi-fi and a refrigerator/microwave in all accommodations. 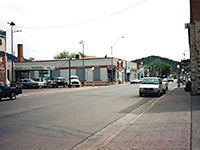 Recently acquired by the Rodeway Inn chain, the small (16 room) Downtowner Motel is regarded by many as the best place to stay in Williams, Arizona. It has a central location on Route 66, newly redecorated rooms including plasma TVs & granite work surfaces, welcoming staff, and a wide choice of items in the free continental breakfast. Some rooms are available with a microwave, refrigerator and whirlpool bath. The property dates from the 1950s and retains some of the style and decor from that bygone age. The south entrance to the Grand Canyon is 55 miles from Motel 6 Williams West, one of many budget priced motels along Route 66 in the town center, accessed from I-40 exits 161 or 163. The motel has a relatively modern design, with interior corridors, and a quiet location facing a side street. The nearest restaurants are two or more blocks east, while Grand Canyon Railway is half a mile away. Facilities are an indoor pool, hot tub and coin-operated laundry. Motel 6 Williams East offers some of the closest lodging to Grand Canyon Railway, the station being just 0.3 miles away. The interior corridor property sits between the two lanes of Route 66 towards the west edge of Williams, right opposite Safeway supermarket and one restaurant; many more dining places are found a few blocks east. Like all properties of this brand, the main attractions are the low rates and convenient location; the only facilities are free wi-fi, free coffee and a refrigerator in some of the rooms.